The idea for this wallpaper is actually quite lame. It's an enchanted scan from Crisis Core with addition of the sky and Cloud's face. I decided not to put any text here because I think it's allright the way it is. Software used: The Gimp. the background is quite blurry though. I really like the black and white feathers floating around as well. The lighting is just right. However the background is a bit blurry. Haha well this picture kinda cool!I never mention how cloud look like in the crisis core picture now I finally see it and it's pretty cool! Very nice, and thank you for the picture. 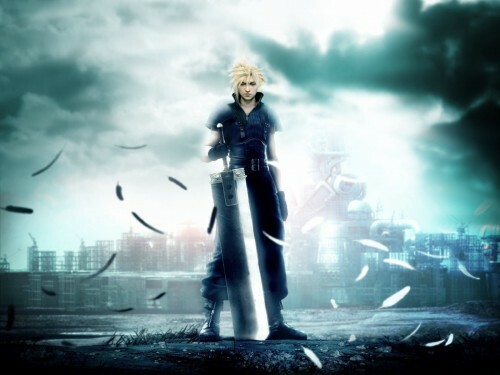 Interesting seeing Cloud's head on Zack's body. very nice =D good job! I sortof agree with SupAhSusHi. I mean. the bg looks great, but it would be better if the angle of the head was slightly different. his body is a little more on the right, so that's where his gaze should be, on the right, facing down. very nice FF7 paper. I have been looking for one like this for a while now and this is great. i like the dark colours, the white feathers and the overall gloomy feeling of the world behind. fantastic.. the best crisis core's wallpaper..
i thought it was supposed to be zack ?